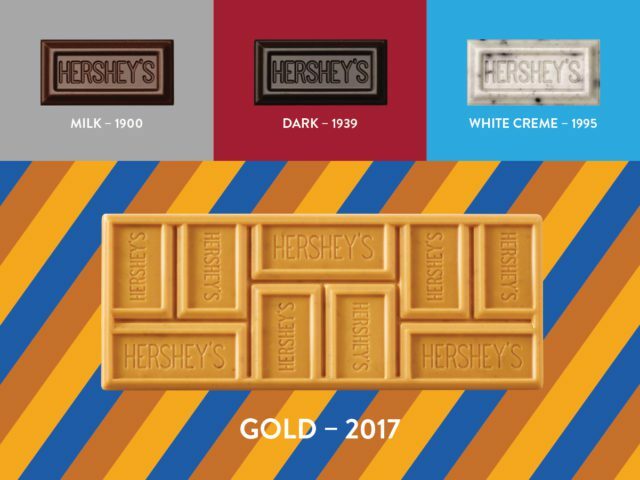 HERSHEY, Pa., U.S. – The Hershey Company, the leading manufacturer in United States confection, announces the official launch of Hershey’s Gold bars, the fourth flavor in the history of the iconic brand. Its launch date is in celebration of the brand’s official sponsorship of the United States Olympic Committee (USOC) and the significance of today marking the 100-Day countdown to the PyeongChang 2018 Olympic Winter Games. For the fourth time in the company’s history, Hershey is announcing a new flavor to their namesake portfolio, Hershey’s Gold. The new bars are a caramelized creme that feature salty peanut and pretzel bits to give consumers a sweet, buttery taste that is topped off with a creamy and crunchy finish. Hershey’s flavor history began in 1900 with the launch of its iconic milk chocolate bar, followed by Hershey’s Special Dark chocolate in 1939. It wasn’t until 1995, 56 years later, that the company introduced Hershey’s Cookies ‘n Creme. Now in 2017, the iconic Hershey’s brand will launch Hershey’s Gold, the first mass-market, golden creme confection in the U.S.
“The buttery, sweet taste of Hershey’s Gold bars provides an entirely new way for consumers to enjoy our brand,” said Melinda Lewis, senior director/general manager, Hershey’s Franchise at The Hershey Company. The development of the new product stemmed from consumer demand for new ways to experience the iconic brand. Trends also show the rising popularity of crunchy multi-textured candy2. With Hershey’s Gold bars, the company recognized that consumers favor a complex combination of ingredients, which led to the unique variation of sweet and salty, crunchy and creamy. Over the past century, The Hershey Company has introduced innovations driven by consumer demand, while still maintaining the legacy of its iconic brands. Hershey’s Gold bars are the fourth flavor profile for the leading confectioner in more than 100 years and positions Hershey as one of the top innovators in the food and beverage industry, underscoring the legacy of its founder Milton Hershey. In support of the Hershey’s Gold bars launch, and as a partner of Team USA, Hershey’s brand proudly welcomes Apolo Ohno, two-time Olympic Gold medalist and the most decorated American Winter Olympic athlete of all time, and Rico Roman, 2014 Paralympic Winter Games Gold medalist, Army Veteran and 2018 Paralympic Hopeful, to its athlete roster of brand ambassadors. In the lead up to, and during the Olympic and Paralympic Winter Games, both Ohno and Roman will serve as Team Hershey’s athletes and inspire consumers nationwide to embrace the Olympic and Paralympic spirit with the new Hershey’s Gold bars. In addition, Simone Biles, five-time Olympic medalist, who joined Team Hershey’s in advance of the Rio 2016 Olympic Games, will help debut and celebrate the new flavor. The new product launch syncs up with the official 100 Day countdown to the PyeongChang 2018 Olympic Winter Games, but will be a permanent addition to the Hershey’s line-up. After the Olympic and Paralympic Winter Games, consumers can continue to celebrate the sweet taste of victory with the taste of Hershey’s Gold bars. Starting Dec. 1, fans can purchase Hershey’s Gold bars in retailers nationwide and start cheering on Team USA in advance of the PyeongChang 2018 Olympic and Paralympic Winter Games. For those who just can’t wait, Hershey’s Gold Caramelized Creme Peanuts & Pretzels is now available at select Hershey’s Chocolate World locations in Las Vegas, Nevada and Hershey, Pennsylvania. The new flavor will be available in both standard size 1.4-oz. (SRP starting at $0.99) and king size 2.5-oz. (SRP starting at $1.69).